When I was a young girl we lived far out in the country. The only way that we could get salmon was canned. So we made the canned salmon into croquettes, which I still love to this day. Now that we can get fresh salmon anytime, I make it more often and use it in many different ways. 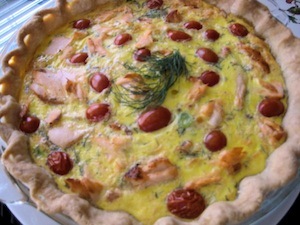 The recipe for this week features fresh roasted salmon in a quiche. When you get a fresh piece of salmon, rub it with olive oil, salt and pepper and roast it in the oven until done. This gives you different levels of flavor in whatever way you are using it, and especially the quiche that we have here. Exactly what you want! You will have the crisp crust, melted cheese, onions, dill and tomatoes and this delicious baked salmon that is already seasoned. Serve each slice of quiche on a bed of arugula. Drizzle the arugula with a little of your favorite vinaigrette. Add the shredded smoked provolone to the bottom of the cooled pie crust. Beat the eggs together with the half and half, green onions, chopped dill, salt and pepper. Pour into the crust on top of the cheese. Place salmon pieces on top of the egg mixture. Add the grape tomatoes to the top of the quiche. Bake in a 350º pre-heated oven for about 35-40 minutes or until the quiche is set in the center. Do not over bake. Note: I baked the salmon rubbed with olive oil and seasoned with salt and pepper.